Our new type of float valve can make your car run better and get better performance, Read about it here. The DAYTONA FLOAT VALVE was designed to prevent flooding, caused by dirt, rust, excess fuel pressure, etc. As a result, it does maintain a constant fuel level. In addition, it will increase performance, give smoother idling, and increase fuel economy. Click for a larger View perfect fuel level is maintained in the carburetor bowl from idle thru top speed. This improves fuel economy and performance. The life expectancy of the DAYTONA FLOAT VALVE is considerably greater than a conventional needle & seat. PLUNGER OR NEEDLE... 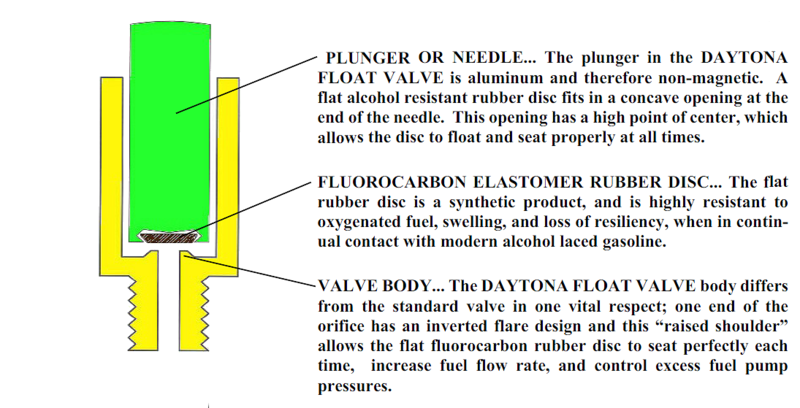 The plunger in the DAYTONA FLOAT VALVE is aluminum and therefore non-magnetic. A flat alcohol resistant rubber disc fits in a concave opening at the end of the needle. This opening has a high point of center, which allows the disc to float and seat properly at all times. FLUOROCARBON ELASTOMER RUBBER DISC... The flat rubber disc is a synthetic product, and is highly resistant to oxygenated fuel, swelling, and loss of resiliency, when in continual contact with modern alcohol laced gasoline. VALVE BODY... The DAYTONA FLOAT VALVE body differs from the standard valve in one vital respect; one end of the orifice has an inverted flare design and this "raised shoulder" allows the flat fluorocarbon rubber disc to seat perfectly each time, increase fuel flow rate, and control excess fuel pump pressures. Straight line Arepresents a perfect mixture of air & fuel, from Idle to top speed. Line B represents the fuel level in carburetor bowl, as controlled by the needle & seat, and also, controls the fuel-air mixture from idle to top speed. That portion of line B above straight line Arepresents a rich mixture, and below a lean mixture. Crepresents the point where you get a perfect mixture, often referred to as the place where my car wants to run. (About 60 to 80 MPH). The dotted line D represents the fuel level and also the fuel-air mixture as controlled by the DAYTONA FLOAT VALVE. 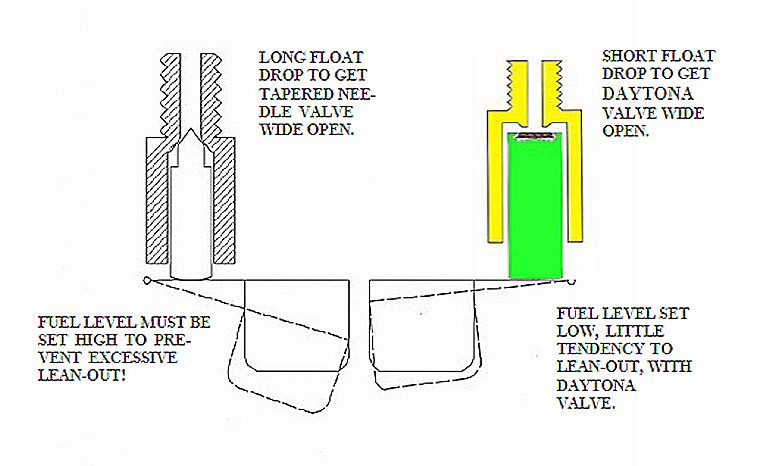 Because the DAYTONA FLOAT VALVE holds the fuel level so near the same from idle to top speed, dotted line D is mostly straight and has very little drop from idle to top speed. When the float is set about 1/16" low, fuel level stays very close to line A, as you see by the illustration. Thus you have greatly increased performance and economy. There is no particular place where the car wants to run. It runs good all the way from idle to top speed. Get better carburation with the DAYTONA FLOAT VALVE, a modern, alcohol resistant fuel control valve for carburetors. If you have a need for our high quality, ethanol resistant kits, or parts to restore or repair your carburetor please contact us at mail@daytonaparts.com or use our contact form on this site with your requests or questions. We are located in beautiful New Smyrna Beach, Florida. Our address and contact information is below.